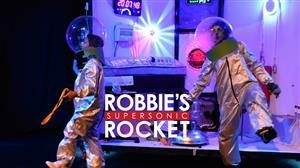 Robbie's Supersonic Rocket - The Musical! This exhilarating, colourful and high-energy musical written by Hazel and Andy Hiles, is ideally suited for children between the ages of 3 to 11 years and is a fantastic and timeless touring show based on their newly published picture storybook. With a cast of four, the show explores the special relationship between an eccentric and inventive grandfather and his young grandson, Robbie’s long-suffering grandmother and the family’s pampered cat, Moggy. The musical includes seven original songs with Grandpa Pops not only inventing and creating an amazing rocket but also playing multiple instruments live throughout the show.